Chinese investment in Africa has increased greatly in recent years. In Cameroon, the years following the last global financial crisis saw a boom in Chinese investments in the rubber industry, in particular in rubber estates belonging to two companies: Sud-Cameroun Hevea SA and GMG HEVECAM. These investments come from Sinochem, one of the largest Chinese state-owned multinationals, and involve the rehabilitation of existing rubber estates, as well as expansion into new areas. Since the initial investment from China, exports of rubber from Cameroon to China increased from almost none to nearly half of total rubber exports in 2011. 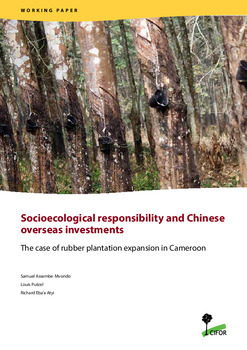 We conducted research into the nature and extent of Chinas investment in the Cameroonian rubber sector and assessed initial findings through the lens of socially responsible investments (SRI). Overall, the picture shows that the two investments are subject to a number of governance challenges, particularly in relation to land allocations. Authors: Assembe-Mvondo, S.; Putzel, L.; Atyi, R.E.